It’s the last CicLAvia of the year! 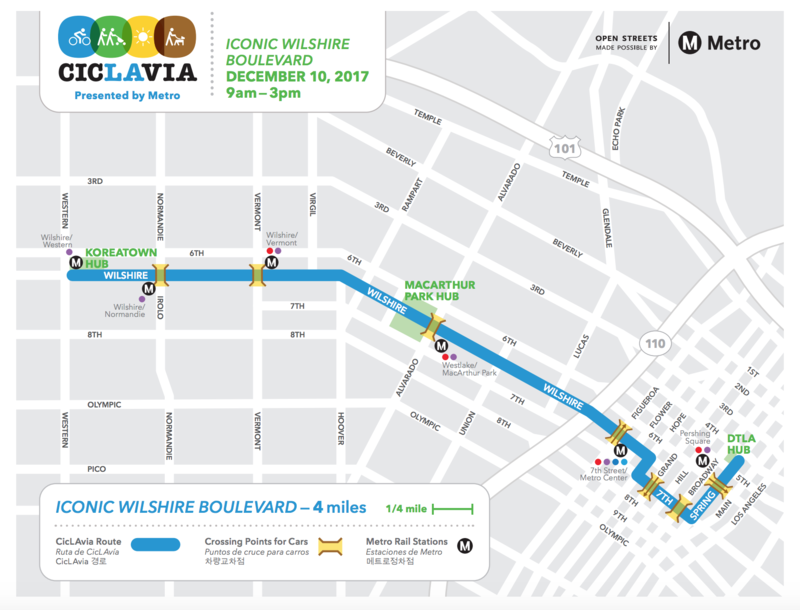 Ride your bike, stroll or skate down Wilshire Boulevard this Sunday, Dec. 10 at CicLAvia — Iconic Wilshire Boulevard. The route easily accessed by five Metro Rail stations. For those coming from further away, consider taking Metrolink to Union Station. If coming to DTLA on the Expo or Blue Line, exit 7th/Metro Station. If coming to DTLA on the Gold Line, transfer to the Red or Purple Line subway at Union Station. Avoid long lines at TAP vending machines by loading fare or a pass on your TAP card in advance. Regular fare for riding Metro is $1.75 and includes two hours of free transfers. Load $3.50 in Stored Value for a roundtrip ride. Bicyclists should use the wider ADA fare gates and NOT the turnstiles or emergency exit swing gates. If boarding with bicycle, please use allocated bike area on trains to avoid blocking doors. Bikes are prohibited on escalators and should be transported instead via elevators or stairs at all rail stations. Metro Bike Share is also available in DTLA for those who don’t have a bike of their own. Buy a pass before the event or use your credit card to check out a bike at a kiosk — $3.50 buys you 30 minutes. The Metro Rail map. Click to see larger version. For information about detours on specific Metro Bus lines during the events, visit Metro’s Service Advisory page. 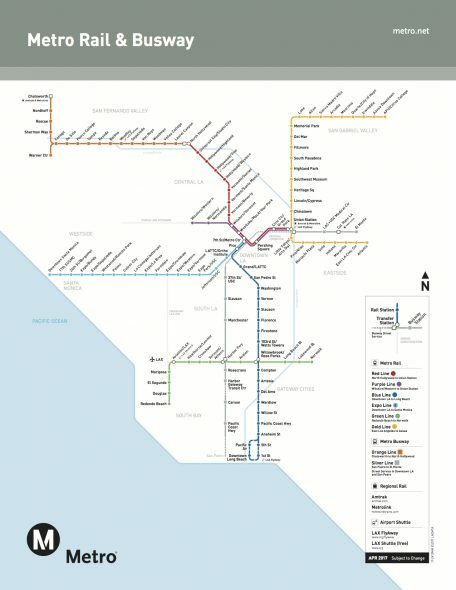 For more information on routes and connections, use the Trip Planner or call 323.GO.METRO. CicLAvia is funded through the Metro Open Streets Grant Program, which provides funding to events that temporarily close city streets to cars and open them to people walking, biking and rolling. The goal of the program is to offer people opportunities to walk and bike on local streets, try transit (maybe for the first time) and foster civic engagement that supports active transportation projects and programs. Hello All Ciclavia Participants…Remember to take a picture of your travels on public transit with your bicycle and post to social media. Please use the hashtags: #bikecar #bikecar101 #bikesontrains to show your support for greater space for bicycle storage on board trains. We look forward to seeing you next weekend at Ciclavia. Have a great day!! !